Below is a list of countries that have not been matched with Georgia. If you know a couple from any of these these country combinations, please tell them about our project. Prince David Bagrationi-Mukhraneli, 32, and Princess Anna Bagrationi-Gruzinsky, 31, seen during their wedding ceremony in the capital of Georgia, Tbilisi, Sunday, Feb. 8, 2009. 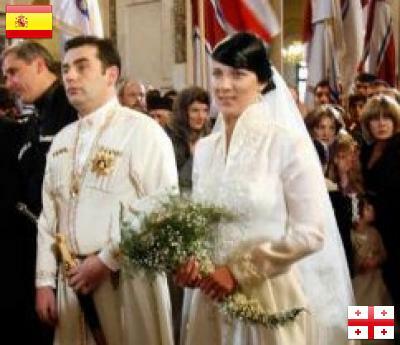 The Spanish-born head of the Georgian Royal Family that once ruled the Caucasus nation and the princess from a Bagrationi dynasty's branch were wed Sunday in Tbilisi.